The global scale map of Swahili Wikipedia posted on this blog a few weeks ago (also reproduced below) sparked a lot of discussion about what exactly was going on in Turkey. There aren’t many articles in the Swahili version of Wikipedia. But, of the articles that have been written, it seems that people really have a lot to say about Turkey. However, that map only tells part of the story. All articles are treated equally and represented by bright yellow dots. What if we instead shade each article by the number of words that it contains? The map above tells quite a different story. 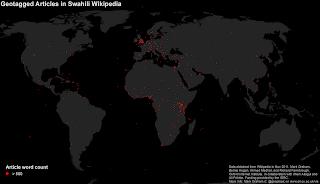 We see that the great mass of Swahili-language articles about Turkey are almost all stubs. In fact it is likely that most of these entries were created by one very committed Tanzanian editor. 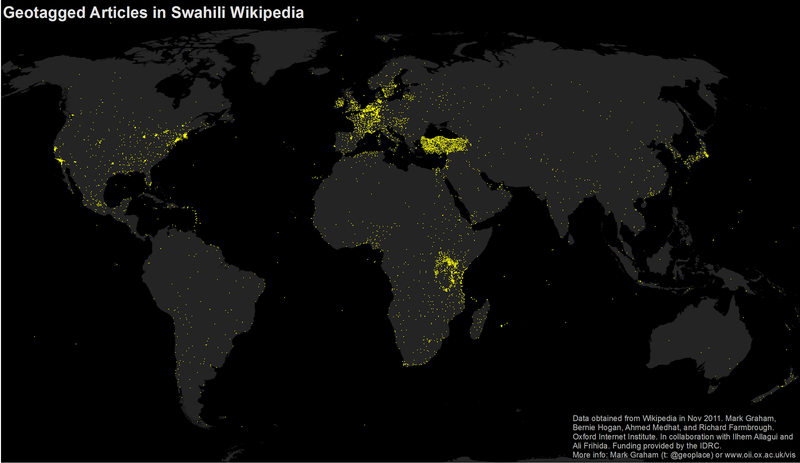 Interestingly, the map at the top didn’t spark much debate about why so many Swahili articles have been written about Western Europe. Likely because most of us are simply used to these sorts of North-South informational inequalities. Another thing that we notice is the cluster of articles in continental Europe (in particular Belgium and the Netherlands) that each contain hundreds of words (indicating that few of them are stubs). Also worth pointing out is the fact that once you filter out all of the relatively short articles (as in the map above), you see that the Swahili Wikipedia has a core focus on East Africa (as well as Africa more broadly) and England (and to some degree, Western Europe more broadly). Article length is obviously only one measure of quality, and we’ve pulled out a range of other metrics such as number of references, images, hyperlinks, contributors and many many other things that we’ll be sharing over the next few months. Ultimately, all of these metrics allow us to get beyond the (very important) question of which parts of our planet are being annotated, and move towards asking how they are being represented.